Worldwide there are some 6000 or so hoverfly species, colourful insects of which about 280 (less than 5% of the world's hoverfly species) have been recorded in Britain. Some are a mere 1cm in length, while a few grow as big as 2.5cm. Hoverfly larve are equally harmless to humans. There are some that feed on aphids and are therefore warmly welcomed by gardeners; however, others are known to eat fungi, plant leaves or bulbs. The bee-mimic Eristalis tenax, known as the Common Dronefly, lays its eggs in stagnant water. Its larva has a long breathing tube that allows it to browse upon rotting vegetation on the bed of shallow water while breathing air at the surface. 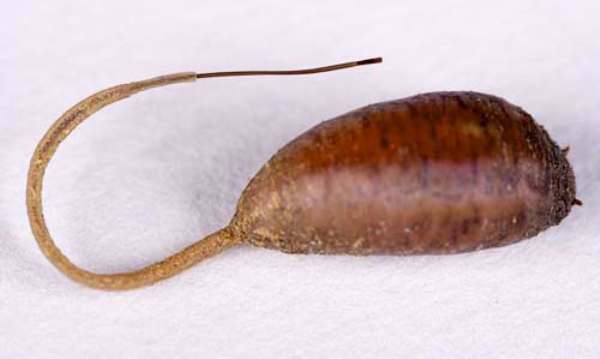 This larva is commonly referred to as the Rat-tailed Maggot. Hoverflies are most evident in parks and gardens at the adult stage which, depending on species, is between March and November. Most adult hoverflies feed on flowers, drinking nectar and eating pollen and/or honeydew, although there are also carnivorous hoverflies that feed on small dead insects. We hope to extend the Hoverflies Gallery as time permits. In In the meantime, if you spot any errors please get in touch; we are always grateful for any help and advice.